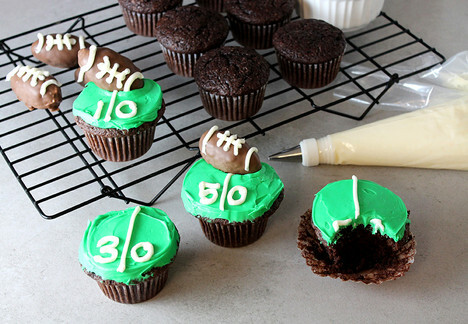 A fun and easy game day treat! For the footballs: Follow the first 2 steps of the Crispy Peanut Butter Bombs recipe and divide into 24 balls. Shape into footballs and continue with remaining 2 steps of recipe. Reserve. For the cupcakes: Preheat oven to 350°. Line 2 12-cup muffin pans with liners. In a large bowl, combine cake mix and brownie mix. Add water, oil, eggs and chocolate morsels. Stir until well blended. Scoop batter into prepared muffin pans. Bake cupcakes for 28 minutes or until a toothpick comes out clean. For the frosting: Transfer 1/3 cup of frosting to a piping bag and reserve. Combine the remaining frosting with green food coloring to desired color. Set aside. Using a small offset spatula, frost each cupcake with the green frosting, leveling the top if necessary. Cut a small hole in the tip of the piping bag. Draw yard lines and numbers on the cupcakes. Decorate each football with laces. Place one football on each of the cupcakes.